The cell. 3. Cell membrane. Lipids. Atlas of plant and animal histology. The structural organization and properties of cell membranes are determined by their molecular components (lipids, proteins and carbohydrates). Lipids are essential for membranes because they spatially organize in lipid bi-layers, i.e., cellular membranes, and can modulate membrane properties since there are more than 1000 different lipid species in eukaryote membranes. Lipids are in charge of physical features of membranes. Length and saturation of their fatty acid chains regulate fluidity and thickness of membranes. The uneven distribution between the two lipid mono-layers generates membrane asymmetry. Electrical charges located in the hydrophilic lipid heads influence the electrical gradient that membranes have between the external and internal membrane surfaces, modulating the membrane potential. Through lateral interactions, lipids can modulate the activity of the membrane proteins. Furthermore, lipids may work as second messengers, leaving membranes and diffusing to intracellular compartments to trigger cellular responses. The lateral heterogeneity of cell membranes are thought to be caused by lateral lipid-lipid interactions, forming small and plastic domains of higher densely packed lipids that contain higher proportions of certain type of lipids and proteins. These regions are known as lipid rafts or membrane domains. Lipids make up around 50 % of the plasma membrane weight, with about 5 million lipids per µm2 of membrane. There are more than 1000 types of lipids distributed through the different membranes of an eukaryotic cell, with specific proportions depending on the membrane. About 5 % of the genes of a cell are related to lipid synthesis. Figure 1. 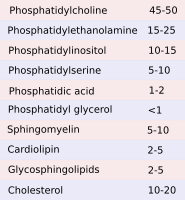 Main lipid types in cell membranes. Membrane lipids show a hydrophobic domain toward the inner part of the membrane and a hydrophilic domain toward the aqueous environment. That is why they are known as amphiphilic. There are three mayor groups of membrane lipids regarding their structure and molecular composition: glycerophospholipids (also known as glycerolipids, phosphoglycerides or simply phospholipids), sphingolipids and sterols (Figure 1). Glycerophospholipids are the most abundant type of lipids in cell membranes, more than 70 % of membrane lipids. Structurally, they have 3 domains: two fatty acid chains, glycerol, and phosphoric acid (Figure 2). Other molecules bind to the phosphoric acid providing molecular diversity. Fatty acid chains are 13 to 19 carbon atoms in length. Most of the carbon-carbon bonds are simple, which are referred to as saturated bonds. More than half of the fatty acids contain at least one double carbon-carbon bond, which is referred to as unsaturated. Each double bond makes a permanent bend in the fatty acid chain and, although rotation of these chains is restricted, the increase of unsaturated fatty acids makes membranes more fluid because the lipids are more separated between each other. Fatty acids constitute the inner hydrophobic (water phobia or water flee) part of membranes. Figure 2. Structure and types of the most abundant glycerophospholypids in cell membranes. Glycerol links the two fatty acid chains to a phosphoric acid of the polar part or head. 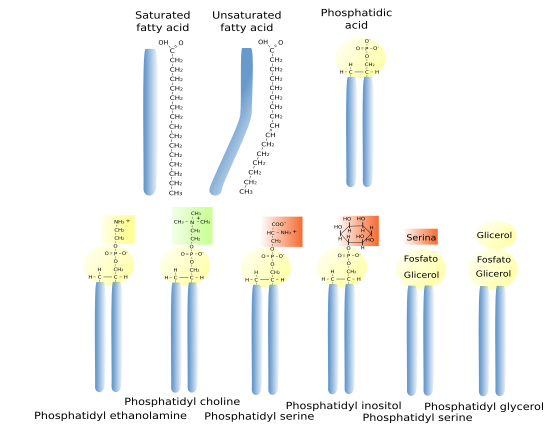 In the head, the phosphoric acid is also linked to a wide variety of molecules like ethanolamine, choline, serine, glycerol, inositol, or inositol 4,5-bi-phosphate, that produces the different species of glycerophospholipids. The names of the different glycerophospholipids derive from these molecules. For example, phosphatidylcholine accounts for more than 50 % of the lipids of the eukaryote membranes. Sphingolipids contain a molecule of sphingosine, which is a nitrogenated alcohol with a large carbon chain bond to a fatty acid chain. These two form a molecule known as ceramide (Figure 3. See also figure 1). Diverse polar heads can be linked to ceramida. In this way, sphingolipids show a molecular structure similar to glycerophospholipids: two hydrophobic chains linked to one hydrophilic head. Most of membrane glycolipids, which are those containing sugar in the hydrophilic domain, are sphingolipids. Glycolipids can be found mostly in animal cell membranes. Sphingomyelin, other type of sphingolipid, contains one ethanolamine or one phosphorylated choline in the hydrophilic head. Sphingolipids are more abundant in the plasma membrane than in organelles, and are proposed, together with cholesterol, as main players in the lateral segregation of membrane molecules into domains such as lipid rafts. Figure 3. Molecular structure of some abundant sphingolipids of eukaryotic membranes. 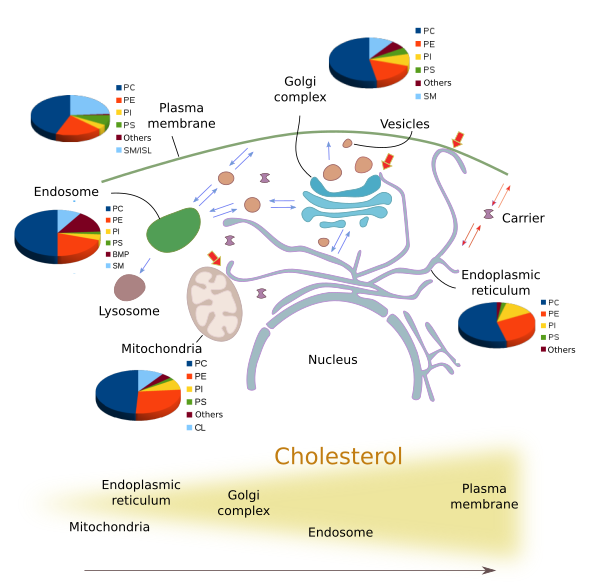 Cholesterol (Figure 4) is the most important sterol in animal cell membranes and the third most abundant type of lipid in plasma membrane (up to 25 % of the total lipids) of animal cells, whereas it is scarce in membranes of organelles like endoplasmic reticulum (about 1 % of the total lipids), mitochondria and chloroplasts. Cholesterol is located among the fatty acid chains of other lipids. Cholesterol is not present in plant cell membranes, in some unicellular eukaryotes, nor in bacteria. However, these cells bear other types of sterols in their membranes. Sterols are essential for the integrity and functions of eukaryotic plasma membranes. Cholesterol influences fluidity, stiffness and permeability of membranes. Moreover, it may modulate the activity of GPCR (G protein-coupled receptors), signal transduction and vesicular traffic. It is important for the organization of membranes, particularly the plasma membrane, because, together with sphingolipids, contributes to create lateral membrane domains. It also participates in metabolic processes such us the synthesis of steroid hormones and bile salts. Figure 5. F Proportion of total lipids in a typical eukaruyote cell (from Vance 2015). There are more than one thousand of different lipids in the eukaryotic membranes that are classified in the three main types described above (Figure 5). The lipid composition varies through the different membranes of the cell. The identity of the cell organelles and their membranes is determined by their molecules, both lipids and proteins. For example, plasma membrane has a different lipid composition than that of the endoplasmic reticulum or Golgi complex. These differences are maintained even under a constant molecular flux of lipids from the synthesis compartments, mainly the endoplasmic reticulum, through the Golgi complex toward other membranes like plasma membrane and endosome membrane. Vesicles, transporters and membrane-membrane contacts make possible the lipid flux between different membranes. The amount and proportion of lipids vary in the different cell membranes (Figure 6). For example, all membranes contain phosphatidylcholine, but this lipid is more abundant in the endoplasmic reticulum membranes. In post-Golgi membranes, i.e., plasma membrane and endosomes, the proportion of sphingolipids and cholesterol is much higher than in the endoplasmic reticulum and the cis domain of the Golgi complex. Mitochondria, besides other common lipids, contain cardiolipin and phosphatidylglycerol as characteristic lipids synthesized by mitochondria themselves. Figure 6. Distribution of the most abundant lipids in the eukaryote cell membranes. Blue arrows indicate the delivery of lipids by vesicles, thick red arrows point the exchange of lipids between adjoining membranes, thin red arrows indicate the transfer of lipids by protein carriers, which shuttle between compartments (not depicted). In the lower image, the increase in cholesterol proportion from the endoplasmic membrane to the plasma membrane is depicted. 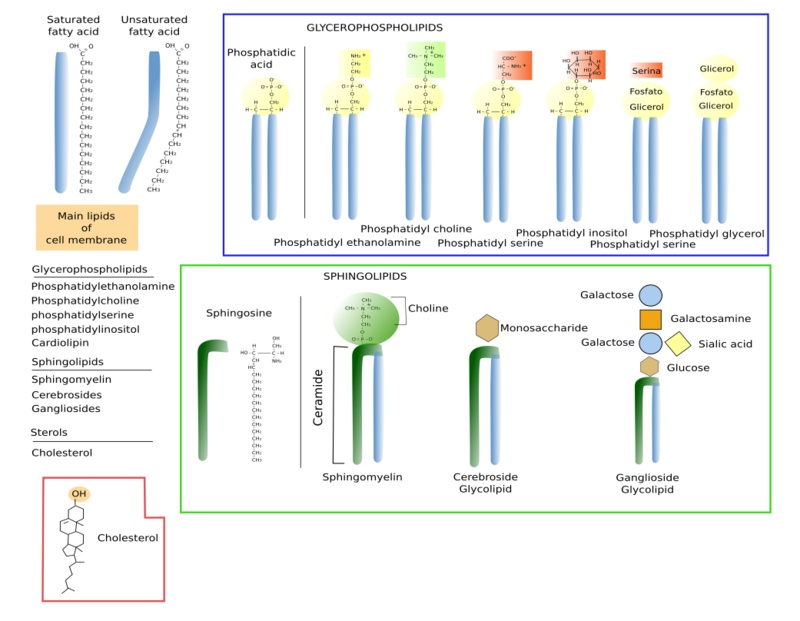 PC: phosphatidylcholine, PE: phosphatidylserine, PE: phosphatidylethanolamine, PI: phosphatydilinositol, PS: phosphatidylserine, SM: sphingomyelin, ISL: inositol sphingolipid, CL: cardiolipin, MBP: bis monoacylglycerol phosphate. (Modified from van Meer et al., 2008). Lipid synthesis. The proportion of some lipids is determined by the place they are synthesized. 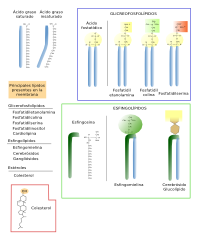 For instance, sphingolipids are assembled in the Golgi complex and therefore are the post-Golgi compartments where these lipids are more abundant, but they are hardly found in the endoplasmic reticulum. In the same way, phosphatidylcholine is synthesized in the endoplasmic reticulum, where it is most abundant. However, this is not a general rule. For example, cholesterol is synthesized in the endoplasmic reticulum, but the amount of cholesterol is higher in post-Golgi membranes because it is quickly transported from the endoplamic reticulum to other compartments by vesicular traffic. Furthermore, some lipids may be synthesized by chemical modifications of other type of lipids. Then, at the same time that a lipid is synthesized another lipid disappears in the same membrane compartment. In this way, the enzymes working locally can change the proportion of lipids in a particular compartment. Selective transport. Lipids cannot travel freely through the cytosol because of their hydrophobic fatty chain. Whatever the transport mechanism, it must selects lipids from the source membrane, travel through the cytosol, and transfer them into the target membrane. In this way, the proportion of lipids in both the source and the target compartments may be different . The transporters in the cell are mostly vesicles that carry the lipids as components of their own membranes. For example, the vesicles budding from the trans domain of the Golgi complex toward the plasma membrane and endosomes are enriched in sphingolipids and cholesterol, when compared with the concentration of these lipids in the Golgi complex membranes. There are also proteins that can transfer single lipid molecules between membranes. They take a lipid from a membrane, hide the fatty acid from the aqueous cytosolic environment, diffuse to other compartment and release the lipid molecule into the membrane of this compartment. Membrane contact sites. At electron microscopy, membranes from different organelles can be observed very close between each other. There are proteins located between these membrane contact sites that transfer lipids between the two membranes, and therefore between the two organelles. Membrane contact sites are found between organelles that are not directly communicated by vesicles, like endoplasmic reticulum and plasma membrane, or between endoplasmic reticulum and mitochondria. There are also juxtaposed membranes of organelles directly connected by vesicles like the endoplasmic reticulum and the trans domain of the Golgi complex, where the CERT (ceramide transfer protein) moves ceramide from the reticulum membranes to the trans Golgi network membranes. Differential degradation and recycling of lipids. All membranes are under a heavy turnover of lipids, either by lipid degradation in situ or by taking them out in vesicles or transporters. Particular lipid species may be selected by both mechanisms, therefore influencing the ratio of lipid types in a membrane or in a membrane domain. Membrane asymmetry is the differential distribution of lipids between the two lipid hemilayers. Whereas both hemilayers of the endoplasmic reticulum membrane show nearly the same lipid composition, but not entirely equal, membranes of the Golgi complex trans domain, and post-Golgi compartments, have quite different composition when comparing both hemilayers. We will deal with this membrane feature in this page. Bissig C, Gruenberg J. 2013. Lipid sorting and multivesicular endosome biogenesis. Cold Spring Harbour perspectives in biology. 5:a016816. Janmey PA, Kinnunen PKJ. 2006. Biophysical properties of lipids and dynamic membranes. Trends in cell biology. 16:538-546. Vance JE. 2015. Phospholipid synthesis and transport in mammalian cells. Traffic. 16:1.
van Meer G, Voelker DR, Feigenson GW. 2008. Membrane lipids: where are they and how they behave. Nature reviews in molecular cell biology. 9:112-124.